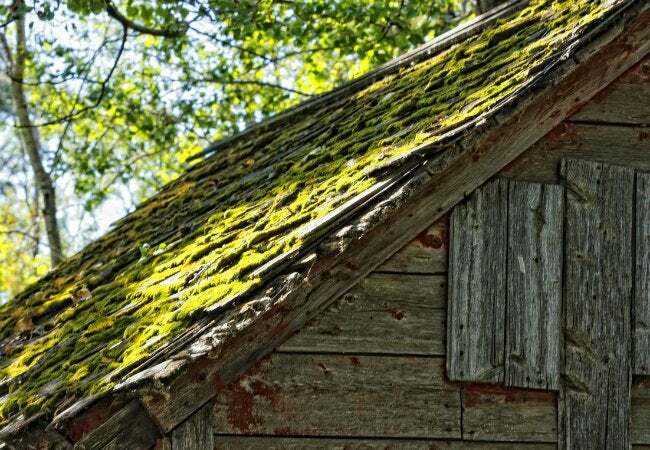 A layer of green moss might look cozy and rustic atop your house, but it can drastically shorten your roof's lifespan. Follow these three straightforward steps to clean off moss—and keep it from coming back. A green, moss-covered roof may make you think you’ve wandered into a fairy tale, complete with a quaint little woodcutter’s cottage. But, in the real world, moss is much less a fantasy than it is a nightmare. Left untreated, the clumpy greenery can cause virtually any roofing material to degrade—most commonly wood and asphalt, but also metal, clay, and concrete—and thus drastically shorten its lifespan. 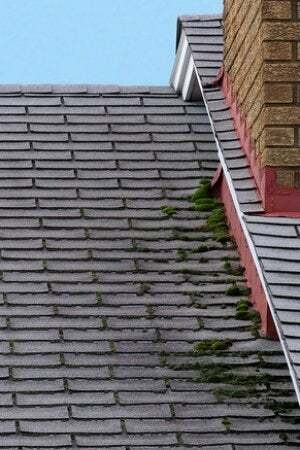 Moss starts as a thin green layer on and between shingles, but then it proceeds to lift those shingles up as it grows, allowing water to seep underneath. Hello, wood rot and leaks. Fortunately, removing moss is a fairly simple task that you can perform on a seasonal or as-needed basis to keep your roof weathertight and great-looking. Carefully place a ladder near the area of moss growth, and don slip-resistant shoes, old clothes, rubber gloves, and eye protection. (You may also want to secure yourself with a safety rope.) Hose off the area with plain water, spraying at a downward angle. Then, use a long-handled soft-bristle scrub brush to remove the moss from the roof, scrubbing from the top down to avoid lifting shingles. As you continue, rub gently—don’t scrape, scour, or pound on the roof—and work in one small section at a time to avoid ripping, cracking, or breaking the shingles. Note: Don’t use a pressure washer on the roof. The high-powered water jets can damage shingles and remove the shingle granules that protect the roof. If your moss problem requires more than just a simple scrub, there are a wide variety of commercial cleaning solutions as well as DIY options that will get the job done. Just wait for the next cloudy day before you head out to the roof with your cleanser of choice—you don’t want the solution to evaporate too quickly. Keep in mind that both commercial and homemade spray cleansers can damage sensitive plants and discolor siding, decks, or pathways, so you may want to spread plastic sheeting below your work area before you get started. Some popular cleansers include Wet & Forget (view on Amazon), a spray-on product for removing moss, mold, and mildew; Bayer 2-in-1 Moss and Algae Killer (view on Amazon), a potassium soap of fatty acids and inert ingredients that you mix with water and then spray on; and Moss B Ware (view on Amazon), a zinc sulfate monohydrate powder that can be applied dry or mixed with water. Whichever you choose, follow the manufacturer’s directions for application; some cleansers should be rinsed off after use, while others specify to be left on. For any of these homemade options, you’ll want to wet down the roof with plain water first, then apply the cleanser and let it sit for 20 to 45 minutes. Lightly scrub with a soft-bristle brush, then rinse with water. Prevent a moss problem from returning by installing strips of zinc- or copper-coated sheet metal just below the top ridge on both sides of the roof. Copper is more toxic to moss and algae, but zinc is much less expensive. You can purchase sheet metal in rolls and cut it into two- to four-inch strips. Attach the strips to the roof using roofing nails or screws with a rubber washer. You also should consider pruning any tree limbs that overhang the roof—natural sunlight is a powerful moss preventive.